Plaque commemorating Andrew Dow Griffen, in the Donaldson Park. It was previously attached to a pavilion, donated by Andrew. Mr. Griffen was born and brought up in Balfron in Stirlingshire and thereafter completed his schooling at Vale of Leven, Dunbartonshire. At an early age, he went to sea and his first trip was as a pantry boy on a ship going to Australia and he was paid the handsome sum of 7s 6d for his voyage. After four years at sea he returned to Glasgow where he worked with Malcolm Campbell, the Fruiterers, but again the wanderlust overtook him and he went to sea again, eventually settling in Auckland, New Zealand. During his early years, he tried many lines of business, the first being a fruit shop and thereafter purchasing land where he went into farming. He had a dairy of about 40 cows and sold his produce from a milk cart in and around Auckland. He was also a pioneer in the growing of strawberries and his strains are to be found all over the world. He will be best known for his writings and his books Sailing Down the Clyde and No Wee Angel can be had from the main libraries throughout the British Isles. Whilst in Auckland in January 1966, I had the pleasure of meeting ‘the wee doo’ and heard much of his good works in the land of his adoption. The memorial to his good lady, the Margaret Griffen Park, was the field where his cows grazed, and the facilities are of Olympic Standard and are known as the Margaret Griffen Memorial Park. I have heard recently that there is to be a drinking fountain erected to his memory at the entrance to the Margaret Griffen Park. His ready Scots wit and couthy manner will be much missed by his friends in Auckland and it was a great joy for me to link up with him in January 1966. 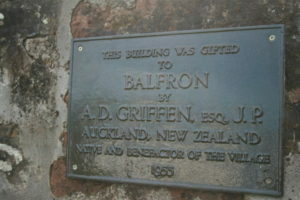 Andrew Griffen is also commemorated by a street in Auckland, New Zealand – Balfron Avenue. 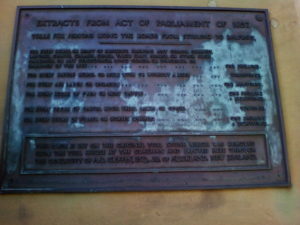 Plaque placed in Buchanan Street thanks to the generosity of Mr Griffen.